Molokai Hula Bliss & Huakaʻi 2019 will take place from May 28th until June 7 on the island of Molokai, Hawaii, USA. 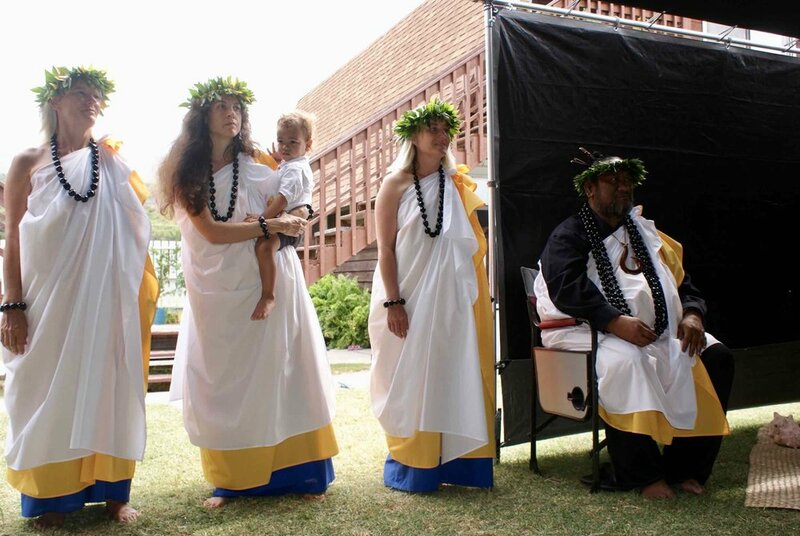 The Molokai Hula Bliss & Huakaʻi is for those who interested in learning Hawaiian hula, Oli which are Hawaiian Chants, all the protocol involved and hear the stories of Molokai coming from a lineage of 50 generations. 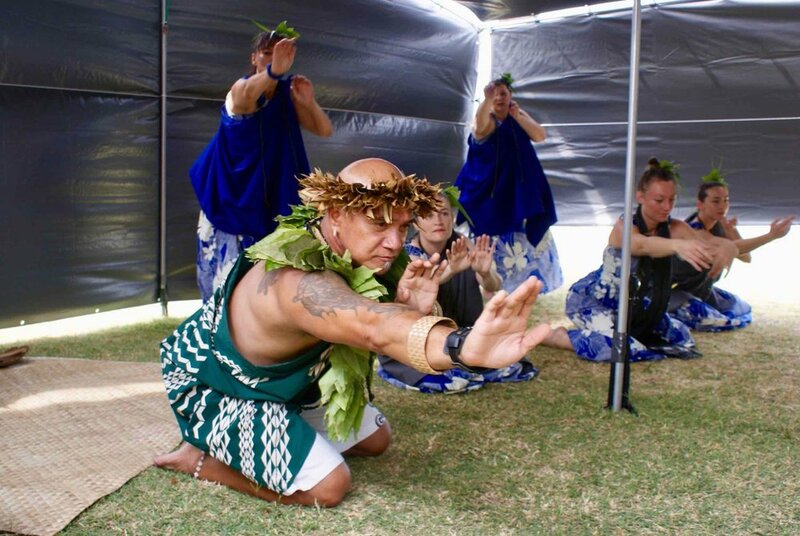 You will learn Hula, Hawaiian Dance, and visit sacred and historical important places on the island of Molokai on our Huakaʻi (Journey) with cultural expert Kumu Paʻa Lawrence Aki. Welcome to the sixth annual of the Molokai Hula Bliss & Huakaʻi (journey), hosted by Kumu Pa'a Lawrence Aki and his Hālau (school) Mana O Molokai. We would love to for you to experience the true aloha spirit of Molokai, of the people and the island itself. Aloha means unconditional love, which is shared in the hula (Hawaiian Dance) , the moʻolelo (stories) and the oli (chants). Molokai Hula Bliss & Huaka'i is an experience where you will dive deep in to the cultural traditions and honour the ancestors and its inhabitants properly. You will learn the ancient teachings which sustains the local people up until this day. Hula is life; hula is way to preserve history, culture and honor places and its people. The hula you will learn are firmly rooted in the land, of which you will visit the sacred sites, some rarely accessible. Read on..
Kumu Pa'a Lawrence Aki is born and raised in the valley of Halawa, Molokai, Hawaii. His maternal grandmother Bernice Kawailani Nahoopii was his first teacher, accompanied by a great many grandaunts and granduncles. For 35+ years he was taught the ancient Hawaiian traditions by his still living blood-uncle Kumu Hula Anakala Pilipo Solatorio. Joining him on the Molokai Hula Bliss & Huakaʻi are Kumu Paʻa Kawika Foster, and his two Poʻopuaʻa (apprentices) Kathryn Roberts & Kyrian van Vliet, in our fifth annual 10-Day Molokai Hula Bliss & Huaka'i – a complete Immersion Program in Hawaiian Culture, Spirituality and Traditional Practices of the island of Molokai. 50th Generation Teacher Kumu Pa'a Lawrence Aki is known for his knowledge on the history of Molokai; his engaging telling of the famous Moʻolelo, stories, of the heroic Molokai chiefs and chieftesses as well as teaching the ancient Hawaiian knowledge of spirituality and healing. If you want to know more about the Wahi Pana (sacred sites), or the many archeological sites of Molokai, Kumu Lawrence will share the story with great passion and detail as was shared with him by his teachers 49th Generation Kumu Hula Anakala (Uncle) Pilipo and Kumu Hula Aunty Harriet Ne. Note that space is truly limited for our Molokai Hula Bliss & Huakaʻi 2019. If you are the one who needs to be there make your booking here. 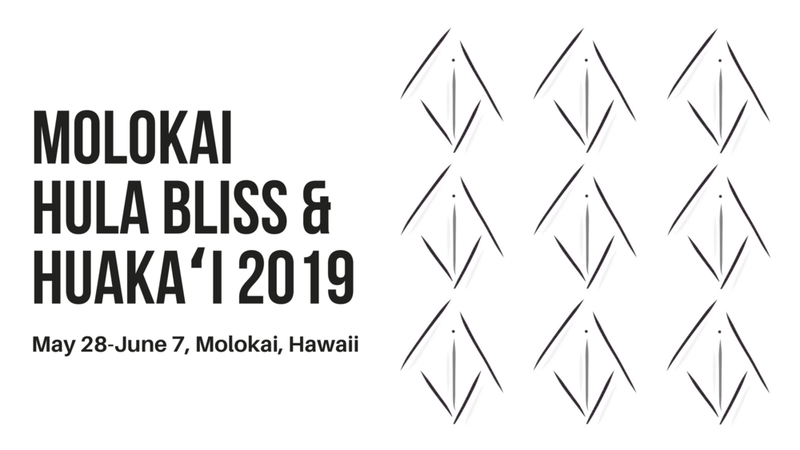 The Molokai Hula Bliss & Huakaʻi is a journey with an opening ceremony on May 28th and the closing ceremony on June 7, 2019. What are you going to experience during his journey? Introduction "Molokai Nui A Hina, Molokai Island Child of the great Mother, Protector and Goddess Hina"
Note there is always a chance of the content and program having changes along the way. Be prepared for anything all the time. Hoʻomākaukau! — Jen B. from Perth, West-Australia, Participant of Molokai Hula Bliss & Huakaʻi 2018. Participants dancing the hula they just learnt at the closing ceremony of the Molokai Hula Bliss & Huaka'i (Journey) 2018. The hula was created and taught by Kumu Hula DJ Pelekai. The beautiful song is Lei Pua Hinahina by Kuana Torres Kahele. You can buy the song here. FAQ - I never danced hula is that a problem? No - There will be hula practices for all levels, and the journey will incorporate places which are honored in those hula dances. FAQ – how do I pay? You can pay for the Molokai Hula Bliss & Huakaʻi online via credit card. Your deposit of USD $1,000 is due September 1st, 2018. The second payment of USD $1,000 is due December 1st, 2018. The remaining balance of USD $1,200 is due March 1st, 2019. No Negotiations. As we are required to pre-pay all of our costs, we are unable to offer refunds or transfers to other programs. Accommodations require us to put up half the total payment with no refunds. Advance booking for accommodation is necessary on our part, due to the limited availability on Molokai. Especially since it is considered a peak time of visitors coming to Molokai. I have remembered that words (aloha/mahalo/pono) have a meaning; that we are all connected; that behaviour (ceremony/protocol) has an impact; that we influence each other. I have remembered the truth about nature - the important role of the land, sea, animals and elements in our day to day lives. I have experienced how story, expressed through dance, words, or location, can transform your soul, emotions, thoughts, words and behaviour. Accommodations are being organized. The excursions take place on different locations on the island of Molokai.